Attending the Fourth Global Symposium on Health Systems Research? Interested in gender and HSR? Join us for a networking event! Coming to the Fourth Global Symposium on Health Systems Research? Interested in Gender and Health Systems? Want to meet other likeminded people? Join us for a Gender Networking Event! Gender equity is a global health priority. Academics, researchers and policy makers—across generations and regions are realizing the need for addressing gender within health systems research. In the spirit of inspiring and fostering collaboration among the emerging and current global health leaders to address gender in global health, we are hosting a networking social event for interested and like-minded HSR attendees. 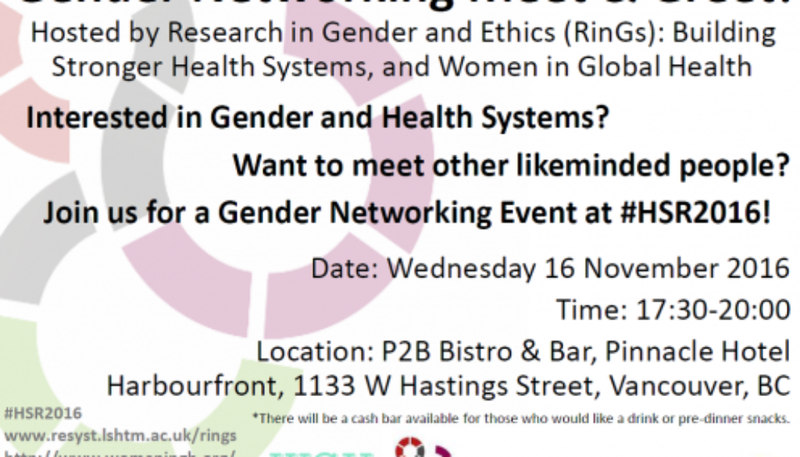 Research in Gender and Ethics (RinGs): Building Stronger Health Systems, in conjunction with Women in Global Health, are hosting a gender networking meet and greet at the Fourth Global Symposium on Health Systems Research. If you work on gender and health systems, or are interested in the topic, please come and join us! All are welcome! *There will be a cash bar available for those who would like a drink or pre-dinner snacks. Women in Global Health (WGH) is a global movement that brings together all genders and backgrounds to achieve gender equality in global health leadership. We believe that everyone has the right to attain equal levels of participation in leadership and decision-making regardless of gender. WGH creates a platform for discussions and collaborative space for leadership, facilitates specific education and training, garners support and commitment from the global community, and demands change for Gender Transformative Leadership.